I like the modifications, especially the beads. I think it adds a nice texture and a little more visual interest to the ornament. 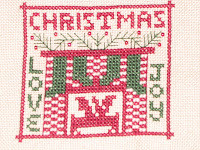 I love seeing everyone's ornaments in the blog, and I'm always finding new ornaments to stitch as a result - this one is no exception.